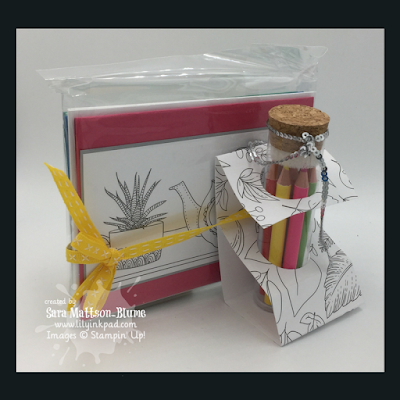 Welcome to the Just Add Color Suite stop on the Inky Friends Suite Designs Blog Hop! 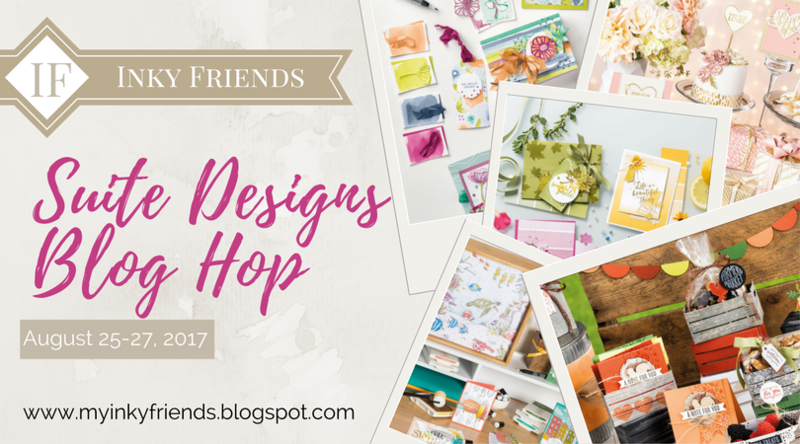 My Inky Friends and I are getting together for our monthly hop and decided to feature a Stampin' Up! 's amazing Suites of papers, stamps, dies, and accessories. If you came from Betty's use of Wood Textures Suite post, weren't her projects divine? The Just Add Color Suite grabbed my attention because I do love coloring, especially during quiet times at school or (meetings). It helps me focus and stay quiet. 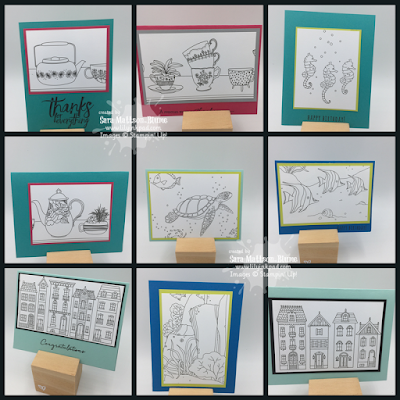 What better images to color than Stampin' Up! images? I made a color your own cards kit. My students love coloring and I knew I had to create something awesome with these little pencil kits I found. The cards are in a cello bag and the entire project is tied together with some Daffodil Delight Stitched Ribbon. Here is a collage of some of the cards-- using the 4 sheets of Designer Series Paper, I made 25 cards, so I now have 4 kits of 6 ready to go! Basically, I took the sheet of Just Add Color Designer Series Paper and trimmed out rectangles of the images. The houses and teapots were easier than the sea, but that turned out ok too. I then added a matte and background out of contrasting colors: Black and Pool Party, Pacific Point and Lemon Lime Twist, Melon Mambo and Bermuda Bay. I also added some sentiments from other stamp sets and left some blank. The pencils are held in a little paper stand that I created using one strip of Designer Series Paper, which I will give more details about Sunday. My next project is one that my students have inspired. 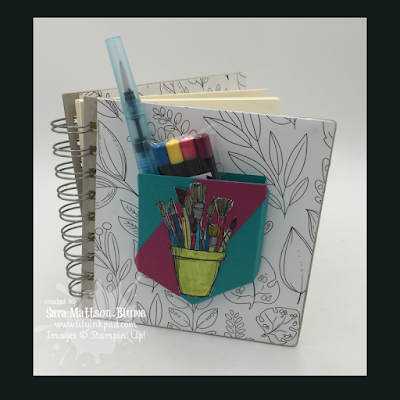 Middle school students love notebooks, sketchbooks, and coloring. I combined all that in one! This can be made with a variety of notebooks. I happened to have one that Stampin' Up! used to offer. First, I cut my Just Add Color Designer Series Paper to size and then I used the Pocket framelits to create a 3D pocket using Bermuda Bay. I added a stripe of Berry Burst for color. 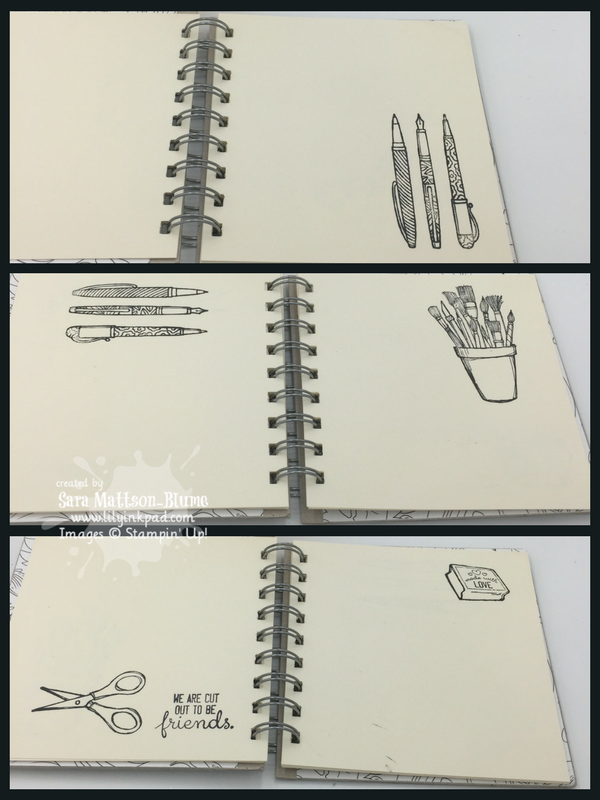 The Crafting Forever Stamp set is a perfect complement to this paper, providing the visual tools for the creativity. Inside the journal, I stamped on the pages. They can be colored or simply serve as inspiration. The aquapainter is one I got in kids' coloring kit and it's short. The pencils are from the April 2017 My Paper Pumpkin. Perfect fit! I had a million more ideas, but I'll save them for later! 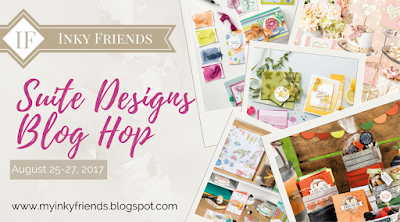 I hope you enjoyed the Just Add Color stop of the Inky Friends Suite Designs Blog Hop. Click NEXT to see Staci's fabulous projects with the Coffee Break Suite, or go backwards by clicking on PREVIOUS to see Betty's use of the Wood Textures Suite. What a great idea for using this DSP! I really like the journal concept with the cute pocket on the cover. These are amazing, Sara!! Such great gifts for anyone who loves to color! I love what you did with this suite! Awww, I love these little coloring kits for different age groups. So creative!! Note to self - my daughter would love the notebook one! Sara! These are precious! I love the way you created so many projects with that paper and so gift-worthy. Sara, these are AMAZING! I wish I had littles to make these for, they are so adorable! 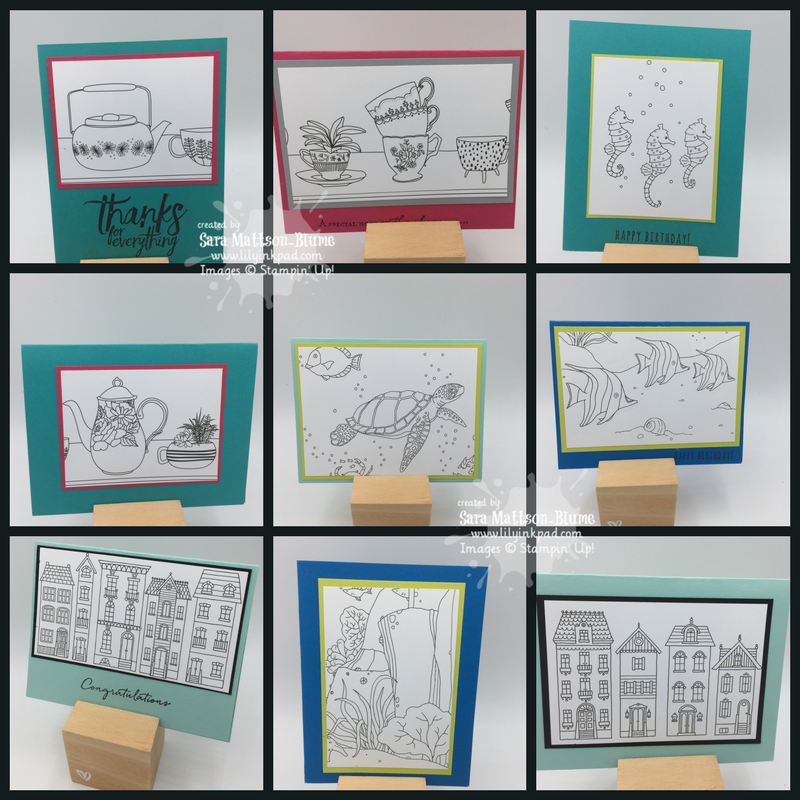 Sara, I absolutely love your cards..what a great idea to use the DSP to make coloring cards!! I love to color and have friends that do as well.. awesome. Your journal book is such a super idea..I have been wanting to purchase those stamps and now I have the perfect use for them!! Thank you for the great ideas, Sara!! Amazing coloring projects Sara! Great showcasing of this dsp!! 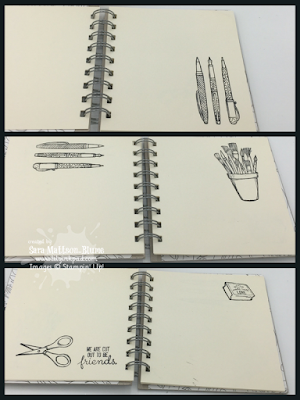 Super cute sketchbook! What a wonderful giftable project suite. I love this idea. Great work, Sara! Oh my goodness! This is too cute. I have to admit to not really seeing this paper!